Antique Godinger of Italy Crystal Pitcher or Decanter, with Silver Plated Spout and Handles, 3-Pieces, Circa 1920's. 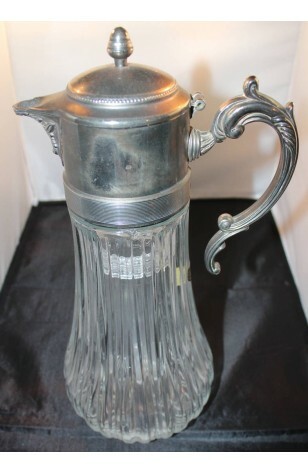 A great Antique Crystal Pitcher/Decanter by Godinger of Italy from the 1920's. It has three (3) Pieces, having the Decanter/Pitcher, with Silver Plated Spout and Handle.. and the Ice Tube, which inserts into the Decanter/Pitcher. The Crystal is in a Striated Pattern, with a Scalloped bottom look, which reflects the light beautifully. Item stands 14" Tall. We do not attempt to polish or shine finishes as we do not have the expertise in doing so. The Silver does need to be polished. Antique, Godinger of Italy Crystal Pitcher or Decanter, with Silver Plated Spout and Handles, 3-Pieces, Circa 1920's.